Severinus Boethius (c.ad480-525), a Roman of noble birth, was a philosopher and translator of classical Greek who served as consul to Theodoric, the Ostrogothic ruler of Italy. Accused of siding with the Byzantines against the Ostrogoths, he was condemned to death. Before his execution, he was imprisoned at Pavia, where he wrote De Consolatione Philosophiae (The Consolation of Philosophy). Various early Romanesque manuscripts illuminated in Germany, France, and England depict the imprisonment of Boethius. He is shown suffering at the hands of the guards, as in this image, but also consoled by Philosophy and the Muses in others. He became a key figure in later medieval schools of thought and education. His work forms the basis of the Quadrivium, the four mathematical branches of the seven liberal arts - arithmetic, geometry, astronomv, and music. Boethius in prison, from De Consolatione Philosophiae, 11th century. Theodoric built in the grand Roman manner at Ravenna, the capital of the Western Empire, in the fifth century ad. A nave mosaic at Sant'Apollinare Nuovo depicts his palatium (imperial residence.) with a triple arched entrance projecting from a colonnaded facade. Each arch originally contained a figure below a hanging crown of laurel leaves - Theodoric in the centre, flanked by his wife, family, and court. The portraits were replaced by curtains after Justinian's reconquest of Italy. Theodoric's tomb, probably begun the year before he died in ad526, is the only monument in Ravenna to be built of dressed limestone blocks. The building is decagonal in plan with a lower storey of ten arched niches and a complex, unfinished upper storey. The ground floor was cross-shaped and groin-vaulted, while the upper floor was circular and topped with a monolithic dome weighing more than 233 tonnes. The dome is encircled by 12 pierced spurs, each inscribed with the name of an apostle. gold with sapphires, pearls, and garnets, Guarrazar. Historical sources combined with archaeological evidence suggest that the Goths originally lived around the Baltic Sea on the islands off the coast of Sweden and in modern Poland. Sometime in the third century ad. these Germanic-speaking tribes began to move southwards into the Ukraine, where they amalgamated with the local agrarian people and formed an integral part of the Chernyakov culture. Their characteristic artifacts included humpbacked bone combs and bow fibulae with flat semicircular heads and long footplates. The Goths established themselves along the northern shores of the Black Sea and gradually expanded south and west into the province of Dacia, abandoned by the Romans. In the fourth century, they were converted to the Arian form of Christianity by Ulfilas, a missionary who translated the Bible into Gothic. Two primary groups of Goths were known to the Romans in the fourth and fifth centuries -the Visigoths (eastern Goths) and Ostrogoths (western Goths). When Hunnic tribes from Inner Asia moved into the Crimean penninsula in the 370s, the Goths fled, along with other tribes, crossing the Danube in 376. Allied with Huns and Alani (a Sarmatian tribe), they defeated the Roman Empire in a decisive battle at Adrianople in 378, killing the Roman emperor Valens. Visigoths were settled in Thrace and the Ostrogoths, Huns, and Alans in Pannonia, in roughly the area of western Hungary. Discontented Visigoths under Alaric invaded Italy in 401. sacking Rome in 410. The Visigoths were allowed to settle in southern Gaul and eventually took control of the Iberian peninsula. The Ostrogoths, under their leader Theodoric, marched to Italy, where he was proclaimed King and allowed to govern the Western Empire. The later fourth and fifth centuries, before these kingdoms were established, are known as the Migration Period, and the distinctive art produced by the Goths at this time consists largely of portable personal possessions such as weapons, jewellery, and horse trappings. The wealthiest examples of these were fashioned of gold decorated with garnet cloisonne; like the Franks, their leaders probably had access to such gold and gemstones as a result of their close relationship with the Eastern Roman government in Constantinople. 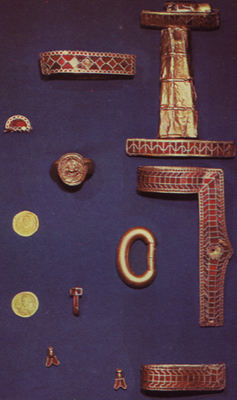 The everyday material culture of the Ostrogoths in Italy, revealed largely by female grave goods, is closely similar to that produced while they occupied Pannonia - the women secured their garments with large bow fibulae and wore rings and earrings in the classical manner. Unfortunately, their stable government and patronage of the arts was cut short by the reconquest of Italy by Justinian, finalized by 555. Visigothic culture, on the other hand, developed steadily in southern France and the Iberian peninsula and is well-represented by grave goods from large inhumation cemeteries dating from the sixth to the eighth century. Large bow fibulae continued to be worn by women, along with earrings and distinctive square buckles. The latter were decorated initially with semiprecious stones and then increasingly with glass. Eventually, they were made solely of copper alloy, engraved with scenes derived from early Christian iconography borrowed from the Byzantine empire. The Visigoths officially converted to Catholicism under Reccared in ad589. 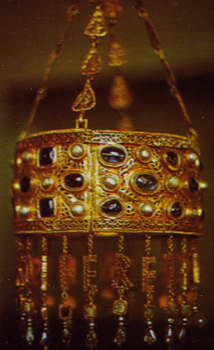 A group of splendid votive hanging crowns, regal offerings, to the Church of Toledo in the first half of the seventh century, was found at Guarrazar, near Toledo. Fashioned of gold embellished with semi-precious stones, their form derives from a fusion of imperial and sacred traditions. The excellent preservation of a few seventh-century churches in northern Spain testifies to a tradition of high-quality building and sculptural ornamentation which prefigures the Romanesque. The invasions of the Arabs in 711 overwhelmed all of southern Spain, but a reduced Visigothic kingdom survived in Asturias and southern France into the ninth and tenth centuries. The Franks were a political amalgamation of many smaller Germanic tribes who lived between the Weser and Rhine rivers. From the second to the fourth century ad, in exchange for the defence of the northern frontier, they were allowed by the Roman Empire to cultivate fallow lands in the heartland of Gaul. Their gradual infiltration ensured that provincial Roman industries, such as glassmaking, pottery, and metalworking, continued without interruption. These crafts are well-preserved in burials in large Frankish cemeteries known as row-grave cemeteries. Weaponry and belt sets in male graves reflect late Roman army styles, while female ornaments are closer to native Germanic traditions. One of the most important finds of the early medieval period is a burial mound discovered in 1685 outside Tournai in Belgium. A signet ring in the grave was inscribed with the name of the Frankish ruler Childeric, who was succeeded by his son, Clovis, in about 481. Many of the finds were later stolen, but a gold crossbow brooch and garnet cloisonne ornaments suggest that Childeric served in the Roman militia, the civil and military bureaucracy in the provinces. The Merovingian dynasty he founded takes its name from his semi-legendary father, Merovech. From the sixth to the eighth century, the Merovingians ruled the Low Countries, northern Germany, and most of France, with their dominions divided into two kingdoms, Austrasia and Neustria. In the sixth and seventh centuries, their buckles, brooches, and weaponry were decorated with garnet cloisonné and Christian imagery. 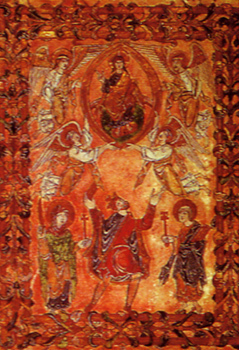 This mixture of Germanic and classical traditions continued in the decoration of manuscripts and reliquaries from the seventh to the ninth century. The Merovingians maintained a monetary economy, investing their wealth in the construction of churches, monasteries, and abbeys, thereby preserving the heritage of stone carving and architecture. Key monuments that survive from this period are the Baptistry of St Jean at Poitiers, and the crypt at the Abbey of Jourre, founded by the daughter of a barbarian noble, which still holds the elaborate stone and plaster sarcophaghi of its abbesses. In 751, Pepin. mayor of Austrasia. deposed Childeric III to found the Carolingian dynasty. Accounts of the settlement of England by different Germanic tribes given by the Venerable Bede, an early eighth-century monk, have been largely borne out by modern archaeology. Comparison of metalwork and pottery found in England with Continental types suggests that the Saxons came from between the Elbe and Weser rivers in Lower Saxony, the Angles from Angeln (modern Schleswig-Holstein), and the Jutes from the Jutland peninsula and perhaps southern Scandinavia. The causes and nature of the arrival of these tribes in the fourth and fifth centuries is complex — some served as mercenaries for the Roman army but the majority probably came as invaders to a land that was ill-defended by the later Roman Empire. Saxon sea-pirates had been raiding the southern coasts of England since the third century"; eventually, in the fifth century, considerable numbers of immigrants colonized large areas of England. By the sixth and seventh centuries, the Saxons, the Angles, and the Jutes had evolved distinctive regional variations of dress and art. As with other Germanic tribes, we understand their art primarily from their grave goods. The women wore either large bow brooches with square-heads or circular brooches of various forms. 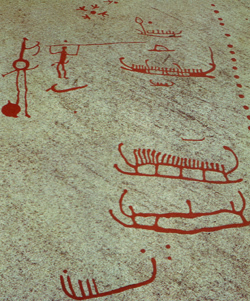 These were decorated with abstract human and animal figures in a style known as "chip-caning". In areas such as Kent, which had close trading links with the Franks, the brooches were often decorated with garnet inlays. One of the most outstanding finds of the entire early medieval period is the grave of an Anglian chieftain buried in a large sailing ship beneath a mound at Sutton Hoo in Suffolk, East Anglia. He was interred with a full set of regalia and weaponry, much of it decorated with gold and garnet cloisonné; silver tableware imported from Byzantium; and symbols of his authority such as a standard and sceptre. Gold coins in his waist-purse, each representing a dillerent Frankish mint, suggest that he was buried sometime in the late 620s. Although his style of burial was purely pagan, by that time, the process of Christianization was well-advanced in England. By the middle of the seventh century, the practice of inhumation with grave goods ceased and our knowledge of Anglo-Saxon art is based upon splendid illuminated manuscripts from monasteries in Northumbria. 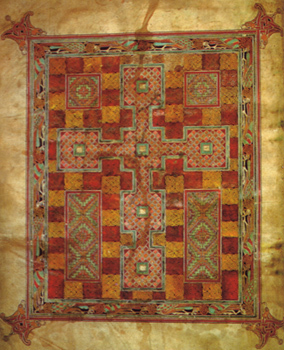 Some early examples of these, such as the carpet pages from the Lindisfarne Gospels, still bore animal interlace and geometric patterns derived directly from metal prototypes, mixed with classical motifs from the Mediterranean world. 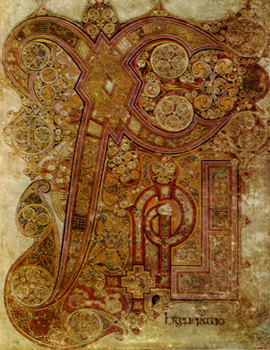 These styles were further developed in monastic scriptoria in Ireland, where native Celtic impulses produced intricate linear patterns underpinned by complex geometric compass work. Some of these interlaced patterns were translated into stone carving, where they appear on large stone crosses dating from the seventh to the ninth century. 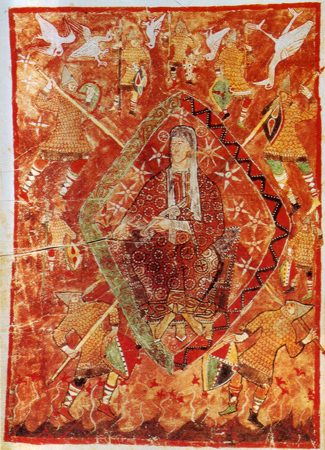 style, before ad716 (Amiatinus I, fol. Vr). It was politically advantageous for the aristocracy of the Germanic tribes to convert to Christianity and the Christian church grew immensely wealthy from donations in the sixth and seventh centuries. Two hundred monasteries existed south of the Loire when St Columbanus. an Irish missionary, arrived in Europe in 585. and by the end of the seventh century, over four hundred flourished in the Merovingian kingdom alone. Monastic foundations served as the springboard for the conversion of the pagan Germanic peoples, with missionaries travelling widely across Europe. Monastic scriptoria played a key role in the transmission of the Latin language and classical culture, copying and illuminating not only religious texts, but also medical and scientific treatises from the ancient world. 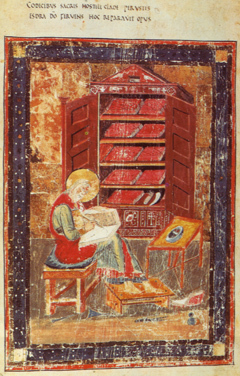 The Codex Amiatinus was copied from a Vulgate version of St Jerome brought from Rome to England in 678; the large Anglo-Saxon copy was being taken back to Rome by Ceolfrid, abbot of the twin monasteries of Jarrow and Monkwearmouth in Northumbria, when he died at Langres in 716.
decorated with animal heads and geometric motifs in cast "chip-carving" and sometimes with garnet inlay. In the first phase of their occupation of Italy, these cultural traditions remained unchanged. By the early seventh century, however, female jewellery shifted almost entirely to Byzantine-style ornaments while the decoration of male belt sets remained closely related to contemporary Germanic styles to the north. Unlike the Ostrogoths, the Lombards were converts from Arianism to Catholicism and their graves often contained distinctive stamped gold crosses. They became patrons of Christianity, erecting both grand basilicas and small cross-plan churches and monasteries. Rich ornamentations in marble, stucco, and fresco have been preserved in the interiors of some of these buildings. 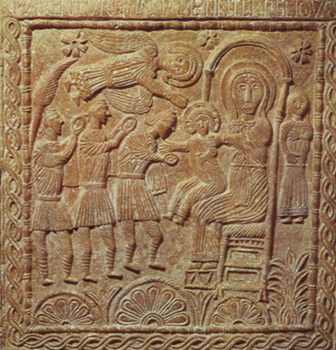 Some, such as the famous relief panel depicting the Adoration of the Magi at Cividale are uniquely Lom-bardic in their very stylized and linear treatment of figures surrounded by interlace. 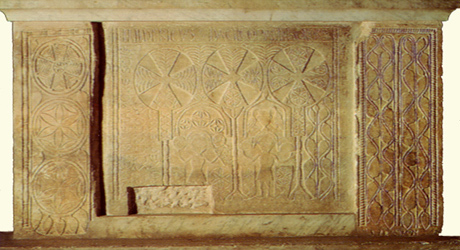 The marble panels at San Pietro in Valle, dedicated by Ilderico II, Duke of Spoleto from ad739 to 740. depict a figure holding a chisel labelled "URSUS MAG-ESTER FECIT", a rare and early instance where a medieval artisan has signed his work. Other carvings reflect Byzantine styles or, as in the case of the seventh and eighth century frescos at Santa Maria Antiqua in Rome and Castelseprio, classical painting styles. All of these form a critical link between the ancient world and the styles that evolved in the Romanesque and Gothic periods. The Lombards in the north were defeated by the Franks under Charlemagne, while the lesser southern principalities survived until the conquests of the Normans in the 11th century. Adoration of the Magi from the altar of the Duke of Ratchis, San Martino, Cividale, c. 740. "Viking" is a generic name applied to the seafaring raiders from Scandinavia whose invasions terrorized Britain and Europe from the ninth to the eleventh century ad. They were the last true pagans, perceived as such by the Christianized Germanic kingdoms, and their extensive oral sagas, written down in the high Middle Ages, were sources of pagan myths and social traditions for the early medieval period. Although the Norse were settled agricultural peoples, their primary means of communication was by sea. Improvements in shipbuilding in the early medieval period meant that long-distance travel and trade became increasingly practical. The raicis by Norsemen from across Scandinavia, which began in the late eighth century, were not co-ordinated in any overall fashion but had as their initial goal the acquisition of precious metals to be used as bullion in a non-monetary economy. 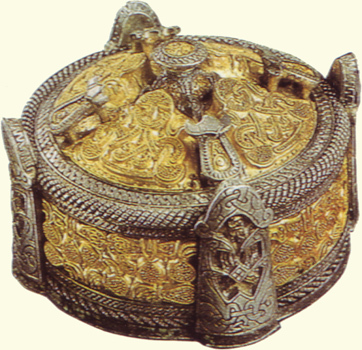 Many hoards of gold and silver ornaments, often cut up for melting down, survive from the early Viking period. Lightning raids, particularly of the treasuries of wealthy monasteries, were often followed by settlement. A network of trading stations was established in the Baltic, along the rivers of Russia, in Iceland. Greenland, Ireland, northeast England, and northern France. Superb Viking metalwork, executed with complex animal interlace in various styles, was mirrored in wooden carvings such as those found in a burial at Oseberg, Norway, which include elaborately decorated carts, sledges, and a ship. They also erected large standing stones decorated with carved, narrative figurai scenes and/or runes, the native alphabet. Martens Grotlingbo, Gotland, Sweden, eleventh century.